An exclusive hotel in a bustling university town was about to undergo a much needed multi-million dollar renovation to refresh dated décor, add a new restaurant, and expand its facility. A key reason for the renovation was to achieve a coveted four diamond designation. The title would help them grow business while maintaining their status as the city’s first impression to guests and visitors of the nearby university. The hotel’s conference center venue, including all meeting and event spaces, would be unavailable for at least six months while construction was underway. The university owned the hotel, and they wanted to find a way to keep guests and event traffic flowing. The answer was a temporary structure. The idea was to maintain a business as usual attitude and provide the level of satisfaction and guest service expected of an exclusive hotel venue. 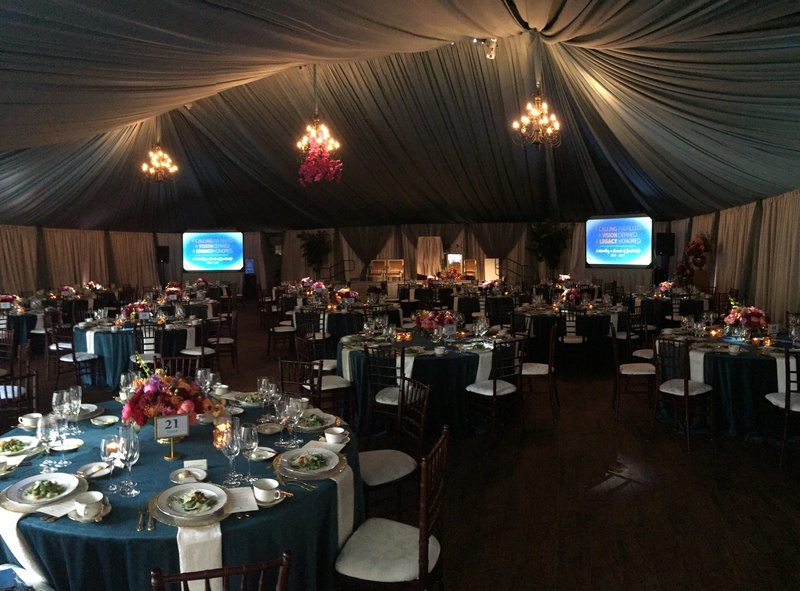 Mahaffey was chosen as their vendor partner based on our past experience with large temporary event structures and our portfolio of stunning large venue custom designs. The greatest challenge for the hotel owners was meeting the expectations of business as usual in a temporary structure. They needed a conference center with multiple spaces, versatile enough to replace the event rooms usually available in the hotel. They required the same amenities expected for events such as weddings, dinners and more formal meetings. The atmosphere of luxury and seamless services was crucial. The structure needed to be sturdy and portray the likeness of a permanent structure, with an air of elegance. They were relying on Mahaffey to develop, design and create a modern, fully functioning hospitality venue to serve as an extension to the hotel. In fact, they were adamant that the venue be installed in the adjacent hotel parking lot. Include 5 event or meeting rooms of varying sizes. Include amenities such as hardwood floors, lighting, HVAC. Include elegant features, like glass walls. Provide easy access for guests and staff. Mahaffey’s comprehensive solution featured three structures as well as project management and design services to ensure the guest experience remained intact during the renovation. Plans featured a huge marquee structure which was divided into five meeting rooms. Additionally, a walkway with canopy over the main entrance was added for easy access to the structure and a satellite restroom facility. Mahaffey designers suggested hard panel walls to provide the appearance of a permanent structure and the addition of glass fabric window features across the large 150-foot main marquee structure to create a sophisticated façade. 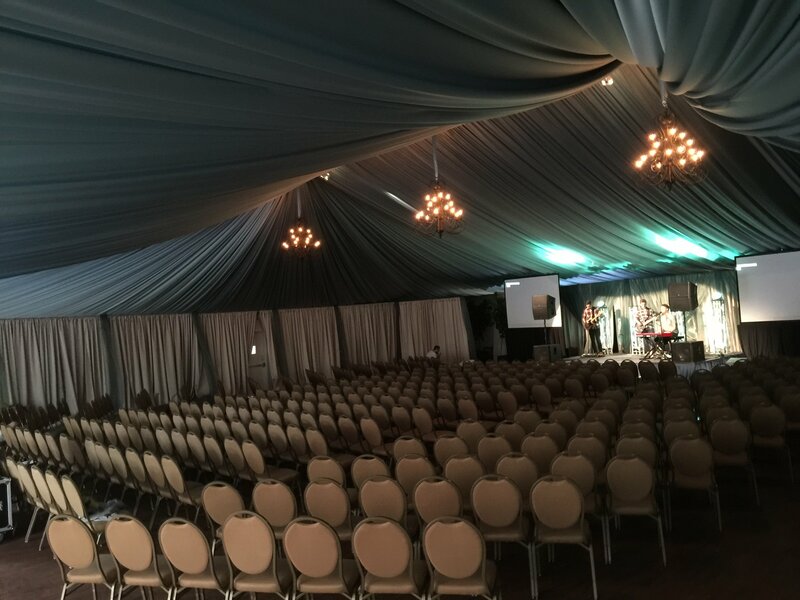 Custom Marquee tent structure, totaling 12,300 sq. feet. 256 sq. foot walkway with canopy. Expert project managers, designers and an expert installation team. The Mahaffey team expertly navigated challenges including parking lot with a sizeable slope. Our team engineered a graded floor system beneath the massive marquee structure that leveled out the extreme elevation differences to create a level floor in the main structure. The hotel was busy and open during the entire renovation, with parking lot traffic throughout the installation process. It was a lot to accomplish, but the Mahaffey team successfully completed the project within the 14-day window originally proposed. The first event scheduled in the temporary conference center was an important retirement dinner for a former university president. It was staged in the larger ballroom and included an elegant dinner with beautifully designed decorations. The venue proved a worthy host for large formal gatherings like the retirement dinner and smaller informal meetings. The client was very pleased with the results. The conference center project continued to serve as a highly functioning location, with events planned almost daily throughout the six-month renovation. Modern advancements in temporary structures mean business doesn’t have to stop during major upgrades, even for hotel facilities. Meeting the challenge of business as usual is nothing new to Mahaffey. We have plenty of experience in helping clients achieve seamless service to their customers while we provide the same to ours. 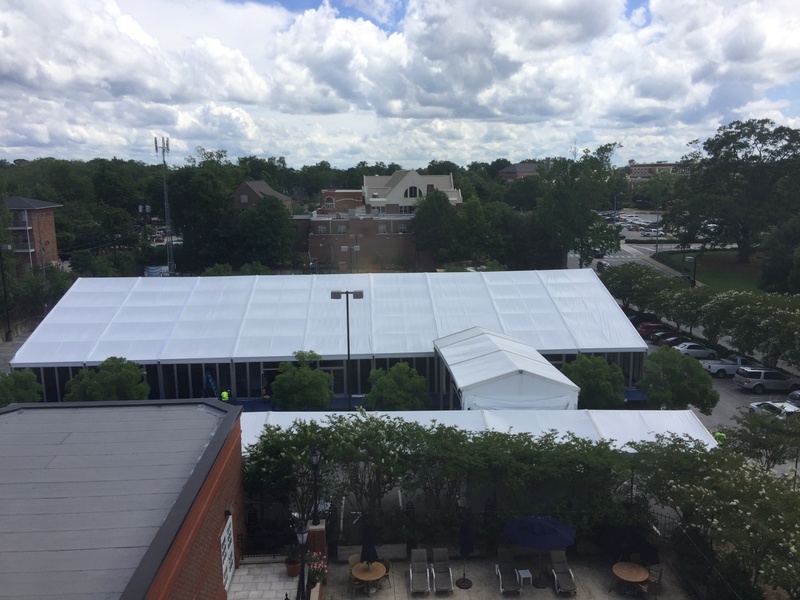 Our professionals offer turnkey temporary structure services-from project management to design, installation and more—call us the next time you have a big event! Have an upcoming project that could use some creative temporary solutions? Contact us today!